SANAA – Inspired by a hole in a facade? Preston Scott Cohen is a Boston based designer and the Gerald M. McCue Professor in Architecture at Harvard Graduate School of Design (GSD). He is the winner of the Herta and Paul Amir Competition ( 2004 ) to design a new building for the Tel Aviv Museum of Art and the winner of the competition to built the Taiyuan Museum of Art . SANAA (Sejima and Nishizawa and Associates) is an architectural firm based in Tokyo. It was founded in 1995 by Kazuyo Sejima and Ryue Nishizawa. 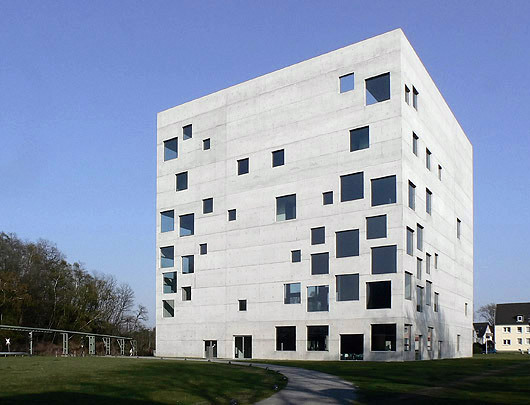 In 2010, Sejima and Nishizawa were awarded the Pritzker Prize, architecture’s highest honor. The Zollverein School of Management & Design, inaugurated on July 31, 2006, is the first new building on the historical coal-mining Zollverein site; declared a World Heritage Site by UNESCO in 2001. 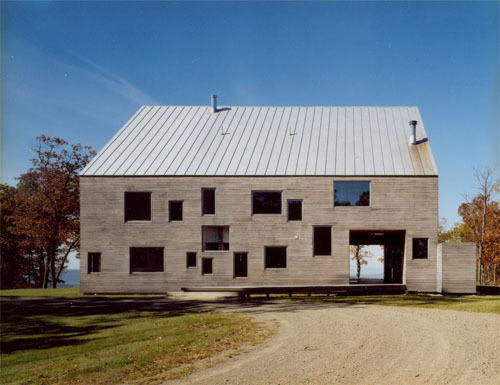 A curtain wall with irregularity distributed windows wraps the peripheral steel frame. It is if nostalgia caused the emergence of a modernist paradigm of construction more fitting to a commercial building than to a house. Is this another example of “Conscious Inspiration”? 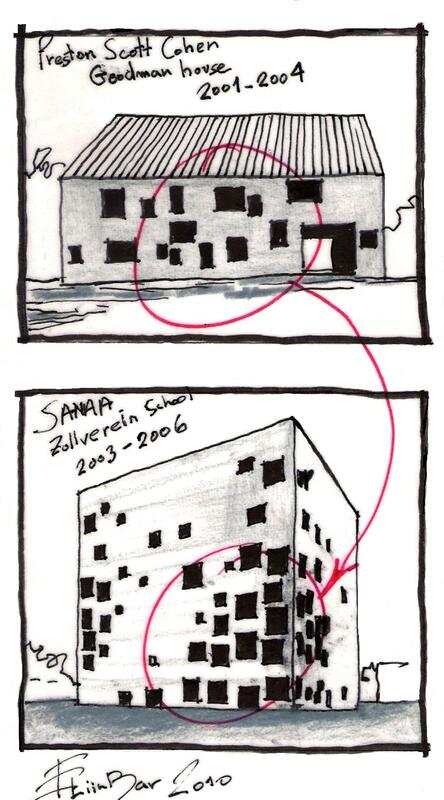 This entry was posted on December 7, 2010 at 5:55 pm and is filed under buildings, public buildings with tags Conscious Inspiration, eliinbar Sketches 2010, Goldman House, Preston Scott Cohen, SANAA, Sollverein School of Management & design. You can follow any responses to this entry through the RSS 2.0 feed. You can leave a response, or trackback from your own site.